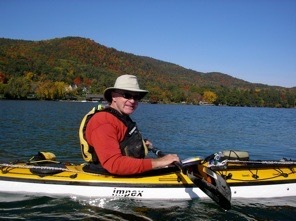 My friend Greg Dunning, a New Zealander with daughters living in the US, is an avid sea kayaker. 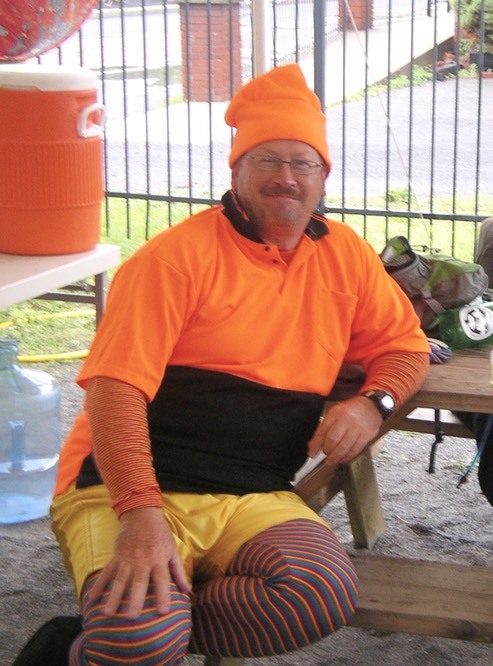 Last year he paddled the length of the Mississippi River. This year he attempted to paddle from Manhattan to Chicago, solo. Terrible weather had him grounded for many days cutting into hyis paddling time. As a result, Greg had to end his trip in Cincinnati. He has allowed me to reprint the final entries from his blog about the trip. If you find them interesting, click on the URL for his website to read more. As some of you are now aware I have called a stop to my paddle After having to deal with several issues, culminating in breaking my glasses, I decided it wouldn't be sensible to push on just for the sake of reaching some completely arbitrary objective. Although sad I feel comfortable with the decision several days later and content with what I achieved. 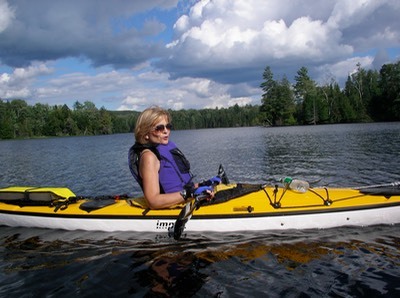 There was some irony in the fact that while the weather conditions were a factor in my decision, on my last paddling day they were as near as perfect as could be with not a breath of wind or any swell and sunny conditions. I could easily have made my 50k target that I had not been able to attain consistently previously. My last day saw me paddle 20 k to Geneva State Park Marina which is just short of Cleveland. I was prepared to paddle another 300 the next day to Fairport which was the last marina b/4 Cleveland and be retrieved from there. There was a small restaurant in the marina shop and I had a nice bacon and egg brunch to supplement my oatmeal breakfast of a few hours earlier. I spent the rest of the day reading 2 of the terrible cheap books I had purchased a few days earlier and resting on the park benches. I had been advised by the marina manager that while he had no problems with me putting my tent up for the night ,there was in fact a no camping allowed policy. He suggested a nice sandy beach on the approach to the marina which I had also picked as my plan B option.. I prefer not to camp on sand as it is hard to get a good purchase for tent pegs and is hard to sleep on (I don't use any form of mattress).I adjourned to the beach around 7.00pm and lay on my ground sheet ,not wanting to attract too much attention by putting the tent up before it got dark. The phone rang. It was my son in law saying he was on his way (a day early) and was about 350k away. I estimated his time of arrival at midnight so continued lying on the sand in the setting sun until dark. 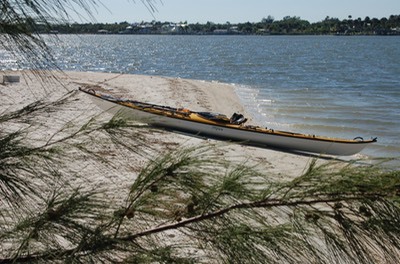 I then packed up, paddled back tot the boat ramp, and unpacked everything in anticipation of Matthew's arrival. Although I was warmly dressed with a merino underlay it soon got quite could so I slipped into my sleeping bag. I was sitting at the table with my head in my arms completely enclosed in and motionless in the sleeping bag when a passing young man decided to investigate the pile of dry bags. He just about had a heart attack when I sat up at his approach. I think the answer to both questions is a qualified yes.. While I didn't make it to Chicago or even my revised destination of Detroit, I did cover nearly 1500 kilometres in some of the toughest paddling conditions I have ever encountered. .The Mississippi River was a doddle compared with this trip. What made the river hard was the unrelenting heat which was just about the only weather condition I didn't encounter on this trip. I didn't have one day off the river due to the weather. On this trip I had 6 days in the first 2 to 3 weeks. I had storms, extreme thunderstorms (I have never seen so much purple on the Doppler weather radar on the TV),strong winds, heavy rain tidal currents and river currents. Friends had commented beforehand that I was going uphill and that I should have started in Chicago. I was aware of all this but the bottom line was that my boat was in NY. Besides I knew of two kayakers who had done what I was proposing one of them on a sit on kayak.. The elements were against me right from the date of the start. The Hudson River is a tidal estuary and one would normally choose a start date to take best advantage of the tides. I didn't have that luxury. On the day I started low tide was around 11.00am and of course this got later day by day and as I moved up the river until it got tot the stage where for the first 6 hours of the day I was paddling against the tide. Then when I got up to Albany the estuary became river and the tide is joined by river current reinforced by the heavy rain over the preceding Memorial Day. The first portion of the Erie Canal is actually the Mohawk River so there is some slight current even in normal conditions. When the extreme thunderstorm hit the canal water level rose 3 feet in a matter of hours and some 10 locks were closed for varying periods. When I made it on to Lake Erie there were several days when the conditions were so bad I was the only boat on the water. People I met at various marinas were amazed when I turned up and even more so when they heard where I had started the day (of course none of them knew anything about a kayak's ability to handle rough conditions---or mine for that matter although there were a couple of occasions when I wondered whether I had just made the worst decision of my life) ( I can't speak highly enough about my boat-it is so well made and handled everything superbly--I even found out it surfs well when I was spun around by a wave and picked up by the next one for hair raising but mercifully brief ride).I basically spent every day on the lake in the surf zone, ending up soaking wet and exhausted. As for future trips, I don't think there will be any more but I have learned never to say never. I did jokingly say to my son in law that the next trip would be on the Snake river in Idaho which is just about as far away from NY as it is possible to get and that I expected him to come and pick me up. For the moment , I still have the boat .It is at the Inwood Canoe Club and next w/e will be taken to the families holiday home near Rhinebeck for storage.